Shadowland creates original theatre that entertains, engages, empowers, and inspires people to interact positively with each other and their environments. Founded in 1983, Shadowland operates from a studio in Parkdale and on Toronto Island. The company has been honoured with three Dora Mavor Moore Awards and was voted Best Grass Roots Theatre by NOW magazine. The company is renown for its distinctive processional theatre, large-scale animated images and site-specific productions. Shadowland creates live theatre that is vital, entertaining, challenging, and visually powerful. 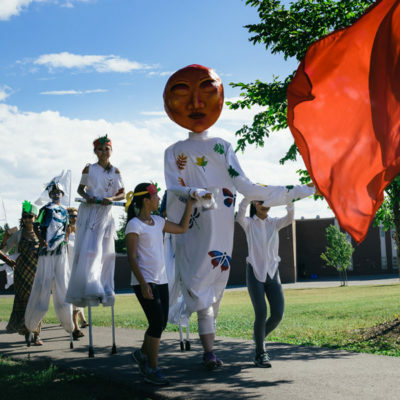 We engage community members in exploring local environments and reimagining local histories, enabling participants and audiences to see familiar places differently. Shadowland’s signature outdoor spectacles incorporate larger than life designs using puppetry, mask, costumes, stilt-dance and live music to animate stories. Workshops invite a collective creation that builds intergenerational relationships, and the development of hands-on skills, to express a sense of self and community.